Our organization is indulged in offering Solar Hoarding to our clients. This Solar Hoarding is manufactured by our professionals using superior grade raw materials in line with international quality standards. The offered range of hoarding is available in different shapes, designs and sizes. Tejonidhi Solar Hoarding Systems is an ideal lighting system for illumination of Hoardings located in areas, which are not connected to the grid power. This fully integrated system combines the latest and most innovative technologies available, providing years of convenient and trouble free lighting. - Cost Effective design Install any ware any place. Being a customer focused organization, surat exim is engaged in offering a wide assortment of Solar Billboard Light. The offered solar lights are provided to clients as per their given specifications so as to ensure their higher level of satisfaction. 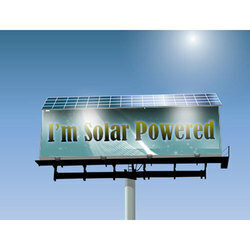 In order to meet the varying demands of our customers, we are involved in providing a collection of Solar Hoarding. We have come up with solar-powered hoardings to protect environment and save energy. Compared to the cost of the conventionl hoardings, the solar power hoarding is economical. Cost of solar powering a 10x20 feet hoarding is Rs 1 lakh and it can be recovered with in two years. The main purpose of advertising in the business world is to promote sales in order to boost profits. Now a day, large outdoor advertising structures are found in places with high traffic such as cities, roads, motorways and highways. Among all types of advertising structures, Back Lit Illumination Flex Board is most popular.